The photographer caught these visiting women looking skeptically at the sculpture Diana of the Chase by Anna Hyatt Huntington. 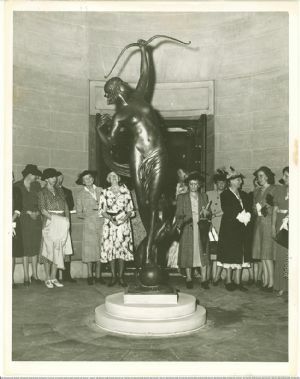 The sculpture was a gift to the Museum by the artist in honor of the Museum’s 10th anniversary in 1941. Huntington was well known for her sculptures of animals and human figures, often small bronze sculptures. The artist hoped to visit the Museum on the occasion of the anniversary celebration, but the impact of World War II made gasoline and vehicle maintenance so expensive, she cancelled her trip. The sculpture of the goddess Diana is positioned in the Museum’s rotunda, looking out over the lake. An original architect’s rendering of the building reveals that the rotunda was envisioned as the home of a large sculpture from the beginning. Because of its striking pose and prominent location, Diana has become an iconic image of the Museum, often appearing on publicity material. The rotunda that houses Diana was enclosed in 1998. Photographer: Raup Camera Center, Hagerstown.